Damage from these creeping thugs is estimated to cost the state of California millions of dollars every year. Loosely related to octopi and oysters, they glide along on their muscular foot, secreting mucus to facilitate movement, leaving their trademark glistening trail behind. Snails came to California from France in the 1850s, imported by gourmands with a yen for escargot. With similar biology, the snail carries an external shell while slugs have evolved without one. Both are most active at night or on foggy, cloudy days. During cold weather, they hibernate in topsoil, while during hot, dry weather, snails can seal themselves off with a parchment-like membrane, and become dormant for up to four years. As each individual is equipped with both male and female reproductive organs, under desirable conditions, their numbers can explode. A snail can lay 80 eggs up to six times a year, while a slug usually produces three to 40 eggs at a time. They have no problem reproducing. Since they are hermaphroditic – that is, they have both male and female reproductive organs -- they do not need to find a mate in order to produce fertile eggs. These gastropods use mucus to slip along on their "stomach feet," creating the silvery trails that glow up at us at night. The mouths of these little garden pigs sport rows of sharp “teeth” that tear plant tissue, so that damage may appear scraped, shredded or just gone. With insatiable appetites, they can eat double their body weight in a day. You can usually recognize snail and slug damage by the smooth-edged, irregularly shaped holes they make in leaves, flowers, or succulents. Sometimes it’s difficult to differentiate damage caused by snails from damage caused by insects such as caterpillars or earwigs. The clearest way to tell is to spot the slime trail on or near the damaged plant. It is important to determine the type of creature causing the damage in order to take the proper management steps to eradicate it. Successfully managing these creatures takes a multipronged approach. 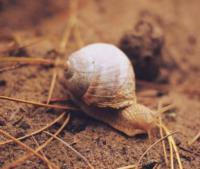 Here are several steps you can take to reduce your snail and slug population. Clean up - Cleaning up any debris where they hide is a great first step. Snails and slugs often hide under stones or wood, beneath low-growing branches, or in ground covers like ivy. 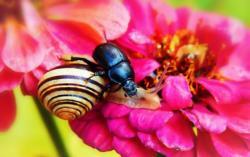 Place vegetable gardens or other snail favorites as far away as possible from these hiding places. Create a less welcoming environment – Sprinklers increase humidity in the garden, which snails and slugs love. Opting for drip irrigation makes the environment less hospitable. Alter surfaces to make it difficult for them to travel. Try gravel, crushed eggshells, coarse sand or wood chips. Diatomaceous earth has edges that are sharp and jagged that can lacerate these soft-bodied pests causing them to dehydrate. Add a copper barrier – Apply copper foil around the tops of planting boxes, containers, raised beds, and tree trunks. This creates a mild electrical charge that repels these slimy invaders. For raised beds, use 4- to 6-inch bands of copper, buried an inch below the soil surface and bent at the top to keep these varmints out. Solarize – If you’re concerned that there are snail or slug eggs in your soil, you can solarize an area by putting a clear plastic tarp over the soil for six weeks in late June or July, but only if you have no living plants in that soil. This is a good thing to do in winter when the soil is fallow, but it may take longer than six weeks if there is not as much sun. Remember that this will likely kill off all creatures in your soil, so proceed with caution – and be prepared to amend afterward to bring the soil back to life. Encourage natural predators – Snails and slugs are delicious treats for beetles, snakes, toads, salamanders, turtles, and birds. Ducks, geese and chickens find snails and slugs to be delicious treats. Of course, these garden visitors also like vegetable starts and seedlings, so it can be a mixed blessing to have them tottering through the edible garden. Go hunting – Grab your kids, a flashlight ,and some rubber gloves and handpick the little buggers after dark! Destroy by crushing and dispose the snails in the garbage or, even better, the compost heap. Use traps - Lay out some boards, flower pots, or inverted melon rinds in areas they might inhabit, raised an inch or so off the ground. Check daily and scrape off the accumulated catch. There are also commercially available traps that may use sugar water or beer as an attractant. 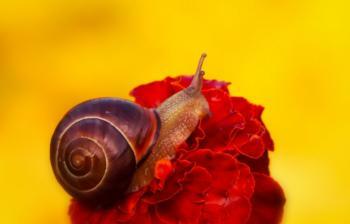 Choose plants wisely – Snails and slugs love to eat plants with tender foliage and fruit. Favorites include seedlings and plants with succulent foliage; they can cause serious damage to basil, beans, cabbage, lettuce and many other edibles along with dahlia, delphinium, hosta and marigold. Ripening fruits close to the ground like strawberries are easy targets. 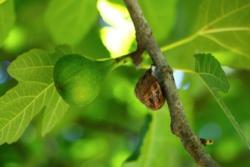 And they’ll climb trees to feed on foliage and fruit, especially citrus. A few soft-leaved species such as begonias, poppies, fuchsias, geraniums, impatiens and nasturtiums are resistant to snails. 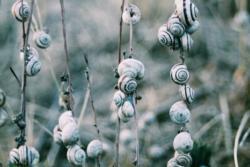 In general, snails dislike grasses, plants that have rigid leaves and woody fragrant plants like rosemary, sage and lavender. Bait - The safest method is to use iron phosphate baits available at any garden store because they are safe to use around children, pets, and wildlife. Water the garden before you apply the bait in order to encourage snail activity. The bait causes the snails to stop feeding. Avoid baits containing metaldehyde, which is highly poisonous to kids, dogs, and cats. With a little planning and a lot of diligence, you can keep these common garden nuisances at a tolerable level. You may miss the slime trails, but your garden will be happier. For more information, visit the University of California Integrated Pest Management guidelines.